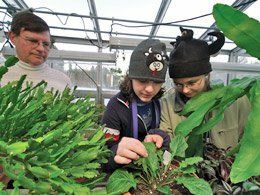 Personal Growth: Professor Don Roeder (left) observes Rowan Reist and Katie McComis at work in the greenhouse. It's a rainy autumn day in the Berkshires, and inside the Daniel Arts Center, on the campus of Simon's Rock College, a dozen freshmen are settling in for their compulsory literature seminar. Students fire up their iBooks and other state-of-the-art laptops as they prepare for the day's discussion of The Inferno, by Dante Alighieri. Joan DelPlato, a professor of art history and women's studies, writes some suggested talking points, including "divine retribution" and "the geography of hell," on the board as the last few students take their seats and class begins. To get things going, she asks for a volunteer to begin the "thought chain," in which one student will quote and comment on a passage from Dante, followed by another who will paraphrase and acknowledge the previous student's thoughts while building on them with an "and" or "but" statement. One student notes how Dante's obsession with Jerusalem foreshadows today's turmoil in the Middle East, and another responds that, possessing the highest per capita murder rate in the nation, the city of New Orleans fell victim to biblical-style punishment with the floods wrought by Hurricane Katrina. Art Previews: Simon's Rock College students meet before heading into the Daniel Arts Center on campus. It's a scene typical of any college-level seminar, except that in this group, there are no high school graduates. The students are all sixteen years old and have all entered Simon's Rock College of Bard, in Great Barrington, Massachusetts, directly after their sophomore year in high school. Warm Relations: Alicia Stube (left) and Jessica Lewis discuss art history with Professor Joan DelPlato. "There are two kinds of people at Simon's Rock," explains Marianne Dologuin, a Simon's Rock junior and a native of the Philippines. "Those who hated high school, who are trying to find a place welcoming of differences, and the overachieving crowd, who are extremely motivated." Dologuin puts herself in the latter category but says that when the two groups meet and mix at Simon's Rock, "they balance each other well." Simon's Rock was founded by Elizabeth Blodgett Hall in 1966 in the belief that for a significant proportion of teenagers, high school is the modern-day equivalent of Dante's inferno. Early matriculation, by this calculation, represents a way out of hell -- or, at the very least, a way station in purgatory or limbo, both of which are also discussed that day in DelPlato's seminar. Since its founding, the small college, which still has only 380 students, has become a leader in the early-college movement. "We have a culture that doesn't like adolescents," explains DelPlato, who came to Simon's Rock fresh out of graduate school eighteen years ago. "This is a place that encourages and celebrates adolescence." It's also a place that works hard to support incoming freshmen, helping them navigate the uncharted waters of dormitory life and the heightened expectations and demands of college-level learning. Teachers do more than teach here; they are active advisers and participants in their students' intellectual and social lives. "My colleagues at other schools are shocked by how much out-of-class interaction there is with students here," says John Weinstein, in his fifth year at Simon's Rock teaching theatre, Asian studies, and Chinese. Says Dologuin, a self-described "language geek" majoring in psychology and politics, "Teachers here, they really care. We talk about things. They understand where you're coming from. We balance each others' energies. They're fun to be with. They're the type of people I'd go to dinner with." 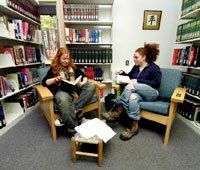 Bookworms: Saiya Miller (left) and Alexandra Barrett enjoy a quiet corner of the library. Blodgett Hall wasn't the first educational innovator to recognize that for many adolescents, four years of high school can be an intellectual straitjacket, or worse. As early as the 1930s, the University of Chicago established an early-college program admitting students at age sixteen. (One of the students was Leon Botstein, president of both Simon's Rock and its parent school, Bard College, and one of the nation's foremost proponents of early-college education). But Simon's Rock was the first freestanding institution founded for the express purpose of engaging high-school-age students in a college setting. "We really have a mission," says Weinstein. "At most colleges, it's not specific or unique. Here, it's clear and constant." Though Weinstein acknowledges that issues occasionally arise surrounding the maturity of some of the students, he says, "annoying behavior is annoying across the board," no matter how old a student is. In any case, as a self-selected group consciously opting out of the highly social and often anti-intellectual environment found in many high schools, Simon's Rock students tend to be more inclined to relate personally and directly to their teachers. "Our students perhaps have better relationships with their teachers than their classmates in high school do," says Weinstein. Group Focus: Professor John Weinstein observes students Caitlin Connolly (from left) Eunice Png, and Noah Appelbaum. The curriculum at Simon's Rock follows two complementary tracks: Students attend either for two years, acquiring an associate degree before transferring to another, more conventional college as juniors (many transfer to Bard, while other popular destinations include Barnard, Bennington, and Hampshire colleges and Brown University), or they choose to stay on and earn a bachelor's degree from Simon's Rock. The college offers a remarkably wide range of courses for such a small school, spanning the arts, sciences, and humanities; all emphasizing writing and thinking. "This isn't kindercollege; you get real academics here," says DelPlato. She originally came to Simon's Rock thinking it was a stepping-stone to her next stop in academia but quickly became a true believer in the early-college model. "This place rehumanizes us," she says. "This place asks us to go back to where you love to learn. We try out ideas without feeling like we're locked into a way of thinking here." Harry Marker, a sixteen-year-old refugee from New York City's Columbia Preparatory School, is a deep and thoughtful teenager, active in the Improv Club and the so-called Jew Crew on campus. One can easily imagine why he might have opted out of Manhattan's conventional prep school scene in favor of early college. Marker credits his Simon's Rock teachers with an unusual willingness to hand over the reins of their class to their students. "The education at Columbia Prep was by rote," he says. "It wasn't interactive. I saw that here, teachers weren't leading but rather guiding. They were encouraging thought. Students are more engaged. Students, not teachers, are teaching the classes." Rural Campus: The rear window of the Fisher Science Center offers a lovely vista of the Berkshire Hills. The campus was once the site of a dairy farm. DelPlato echoes and amplifies Marker's impression of the teaching at Simon's Rock. "I was a different person before I came here," she says. "I didn't really understand what it meant to teach. I knew what it was to lecture. At first, the focus was on me. At a certain point, I realized the focus is on the students. Teachers talk less here. If I just stop talking, wonderful things start happening." Go to "How to Use College Methods in High School."